Not to be confused with South Africa. For the region of the African Union, see Regions of the African Union § Southern. Southern Africa is the southernmost region of the African continent, variably defined by geography or geopolitics, and including several countries. The term southern Africa or Southern Africa, generally includes Angola, Botswana, Eswatini (Swaziland), Lesotho, Malawi, Mozambique, Namibia, South Africa, Zambia, and Zimbabwe, though Angola may be included in Central Africa and Malawi, Mozambique, Zambia and Zimbabwe in East Africa. From a political perspective the region is said to be unipolar with South Africa as a first regional power. Another geographic delineation for the region is the portion of Africa south of the Cunene and Zambezi Rivers – that is: South Africa, Lesotho, Eswatini, Namibia, Botswana, Zimbabwe and the part of Mozambique which lies south of the Zambezi River. This definition is most often used in South Africa for natural sciences and particularly in guide books such as Roberts' Birds of Southern Africa, the Southern African Bird Atlas Project and Mammals of the Southern African Subregion. It is not used in political, economic or human geography contexts because this definition cuts Mozambique in two. The Southern African Customs Union (SACU), created in 1969, also comprises the five states in the UN subregion of Southern Africa. Angola – part of Central Africa in the UN scheme. Comoros, Madagascar, Malawi, Mayotte, Mauritius, Mozambique, Réunion, Seychelles, Zambia, Zimbabwe – part of Eastern Africa in the UN scheme. The Democratic Republic of the Congo and Tanzania, though more commonly reckoned in Central and Eastern Africa, respectively, are occasionally included in Southern Africa as they are SADC members. The terrain of Southern Africa is varied, ranging from forest and grasslands to deserts. The region has both low-lying coastal areas, and mountains. In terms of natural resources, the region has the world's largest resources of platinum and the platinum group elements, chromium, vanadium, and cobalt, as well as uranium, gold, copper, titanium, iron and diamonds. The region is distinct from the rest of Africa, with some of its main exports including platinum, diamonds, gold, copper, cobalt and uranium, but it is similar in that it shares some of the problems of the rest of the continent. While colonialism has left its mark on the development over the course of history, today poverty, corruption, and HIV/AIDS are some of the biggest factors impeding economic growth. The pursuit of economic and political stability is an important part of the region's goals, as demonstrated by the SADC. In terms of economic strength, South Africa is by far the dominant power of the region. South Africa's GDP alone (estimated at circa US$350 billion) is many times greater than the GDP's of all other countries in the region. Generally, mining, agriculture and tourism sectors dominate the economies of Southern African countries, apart from South Africa which has a mature and flourishing financial sector, retail sector, and construction sector. Most global banks have their regional offices for Southern Africa based in Johannesburg, South Africa. Over the years, some the other Southern African nations have invested in economic diversification, and invested public funds into rail, road and air transportation as part of a concerted effort through SADC to boost regional trade and improve communication and transportation. The countries in this region also belong to the Southern Africa Power Pool, which facilitates the development of a competitive electricity market within the SADC region and ensures sustainable energy developments through sound economic, environmental and social practices. The main objective of the power pool is to develop a world class, robust and safe interconnected electrical system across the Southern African Region. According to a report by Southern Africa Power Pool, the three largest producers of electricity in Southern Africa as at 2017, include Eskom in South Africa with an estimated 46,963MW, Zesco in Zambia with 2,877MW and SNL of Angola with 2,442MW. Southern Africa has a wide diversity of ecoregions including grassland, bushveld, karoo, savannah and riparian zones. Even though considerable disturbance has occurred in some regions from habitat loss due to human overpopulation or export-focused development, there remain significant numbers of various wildlife species, including white rhino, lion, African leopard, impala, kudu, blue wildebeest, vervet monkey and elephant. It has complex Plateaus that create massive mountain structures along the South African border. There are numerous environmental issues in Southern Africa, including air pollution and desertification. Southern Africa is home to many cultures and people. It was initially populated by indigenous or native Africans San, Khoikhoi and Pygmies in widely dispersed concentrations. 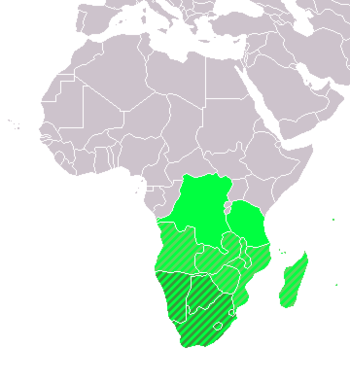 Due to the Bantu expansion which edged the previous native African peoples to the more remote areas of the region, the majority of African ethnic groups in this region, including the Xhosa, Zulu, Tsonga, Swazi, Northern Ndebele, Southern Ndebele, Tswana, Sotho, and Shona people, BaLunda, Mbundu, Ovimbundu, Shona, Chaga and Sukuma, speak Bantu languages. The process of colonization and settling resulted in a significant population of native European (Afrikaner, British, Portuguese Africans, etc.) and Asian descent (Cape Malays, Indian South Africans, etc.) in many southern African countries. Some key factors affecting the food security within the regions including political instability, poor governance, droughts, population growth, urbanisation, poverty, low economic growth, inadequate agricultural policies, trade terms and regimes, resource degradation and the recent increase in HIV/AIDS. These factors vary from country to country. For example, the Democratic Republic of the Congo has favourable climatic and physical conditions, but performs far below its capacity in food provision due to political instability and poor governance. In contrast, semi-arid countries such as Botswana and Namibia, produce insufficient food, but successfully achieve food security through food imports due to economic growth, political stability and good governance. The Republic of South Africa is a major food producer and exporter in the region. Data on agricultural production trends and food insecurity especially in term of food availability for Southern Africa is readily available through the Famine Early Warning Systems Network (FEWS NET) and Southern African Development Community (SADC) - Food, Agriculture and Nature Resource Directorate (FARN). However, this data might not fully capture the reality of a region with large urban populations and where food insecurity goes beyond per-capita availability to issues of access and dietary adequacy. Urban food security has been noted as an emerging area of concern in the region, with recent data showing high levels of food insecurity amongst low-income households. In a study of eleven cities in nine countries: Blantyre, Cape Town, Gaborone, Harare, Johannesburg, Lusaka, Maputo, Manzini, Maseru, Msunduzi (Durban Metro) and Windhoek, only 17% of households were categorized as ‘food-secure’ while more than half (57%) of all households surveyed were found to be ‘severely food-insecure’. Some factors affecting urban food insecurity include climate change with potential impact on agricultural productivity, the expansion of supermarkets in the region, which is changing the way people obtain food in the city, rural-to-urban migration, unemployment, and poverty. The issue of food insecurity in general and urban food insecurity in particular in the region is also characterized by an increased consumption of caloric junk food and processed foods leading to potential increase in the co-existence of undernutrition and dietary-related chronic diseases such as obesity and hypertension. In South Africa for example, while over 50% experience hunger, 61% are overweight or morbidly obese. There is only limited data on the other Southern African countries. As of early 2019, parts of the region are suffering from a period of drought. ^ "Composition of macro geographical (continental) regions, geographical sub-regions, and selected economic and other groupings". ^ "Southern African Development Community :: Home". ^ SADC. "Mining". Retrieved 27 June 2013. ^ Wkley (2002). Deep Histories : gender and colonialism in Southern Africa. Amsterdam [u.a. ]: Rodopi. ISBN 90-420-1229-3. ^ Bauer & Taylor (2005). Politics in Southern Africa : state and society in transition. Boulder [u.a. ]: Rienner. ISBN 1-58826-332-0. ^ Goeieman, Fred (November 30, 2011). "Bridging a hundred year-old separation". Namibian Sun. Archived from the original on October 29, 2013. Retrieved 2013-05-23. ^ de Waal, Alex; Whiteside, Alan (1 October 2003). "New variant famine: AIDS and food crisis in southern Africa". The Lancet. 362 (9391): 1234–1237. doi:10.1016/S0140-6736(03)14548-5. ^ Misselhorn, Alison (2005). "What drives food insecurity in southern Africa? a meta-analysis of household economy studies". Global Environmental Change. 15: 33–43. doi:10.1016/j.gloenvcha.2004.11.003. ^ Yu, Bingxin; Liangzhi You; Shenggen Fan (January 2010). "Toward a Typology of Food Security in Developing Countries" (PDF). International Food Policy Research Institute. IFPRI Discussion Paper 00945. Retrieved 29 June 2013. ^ FEWS, NET. "Southern Africa Country Centers". Retrieved 29 June 2013. ^ SADC, FANR. "Food Security". Retrieved 29 June 2013. ^ al. ], Bruce Frayne .. [et (2010). The state of urban food insecurity in Southern Africa (PDF). [Cape Town]: AFSUN. ISBN 978-0-9869820-1-9. ^ Battersby, Jane (1 June 2012). "BEYOND THE FOOD DESERT: FINDING WAYS TO SPEAK ABOUT URBAN FOOD SECURITY IN SOUTH AFRICA". Geografiska Annaler: Series B, Human Geography. 94 (2): 141–159. doi:10.1111/j.1468-0467.2012.00401.x. ^ Crush, J.; Hovorka, A.; Tevera, D. (21 June 2011). "Food security in Southern African cities: The place of urban agriculture". Progress in Development Studies. 11 (4): 285–305. doi:10.1177/146499341001100402. ^ Riley, Liam; Legwegoh, Alexander (18 June 2013). "Comparative urban food geographies in Blantyre and Gaborone". African Geographical Review: 1–15. doi:10.1080/19376812.2013.805148. ^ Mkwambisi, David D.; Fraser, Evan D. G.; Dougill, Andy J. (1 March 2011). "Urban agriculture and poverty reduction: Evaluating how food production in cities contributes to food security, employment and income in Malawi". Journal of International Development. 23 (2): 181–203. doi:10.1002/jid.1657. ^ Crush, Jonathan; Frayne, Bruce; McLachlan, Milla (2011). Rapid urbanization and the nutrition transition in southern Africa. [Cape Town]: African Food Security Urban Network (AFSUN). ISBN 978-1-920409-69-2. ^ Wrotniak, B. H.; Malete, L.; Maruapula, S. D.; Jackson, J.; Shaibu, S.; Ratcliffe, S.; Stettler, N.; Compher, C. (1 April 2012). "Association between socioeconomic status indicators and obesity in adolescent students in Botswana, an African country in rapid nutrition transition". Pediatric Obesity. 7 (2): e9–e13. doi:10.1111/j.2047-6310.2011.00023.x. PMID 22434762. ^ Fat in Motion. "Obesity in SA". Retrieved 29 June 2013. ^ Reddy, SP; Resnicow, K; James, S; Kambaran, N; Omardien, R; MBewu, AD (12 June 2008). "Underweight, overweight and obesity among South African adolescents: results of the 2002 National Youth Risk Behaviour Survey". Public Health Nutrition. 12 (2): 203–7. doi:10.1017/S1368980008002656. PMID 18547451. ^ LABADARIOS, Demetre; Yul Derek DAVIDS; Zandile MCHIZA; Gina WEIR-SMITH (31 March 2009). "THE ASSESSMENT OF FOOD INSECURITY IN SOUTH AFRICA" (PDF). Human Sciences Research Council. Retrieved 29 June 2013. ^ "Hunger in Africa continues to rise, says New UN report". East African Business Week. 2019-02-14. Retrieved 2019-02-15.